Update!! 12/22 – Giveaway winners have been announced. Check your email for the news. We are focusing on exercise again this month! 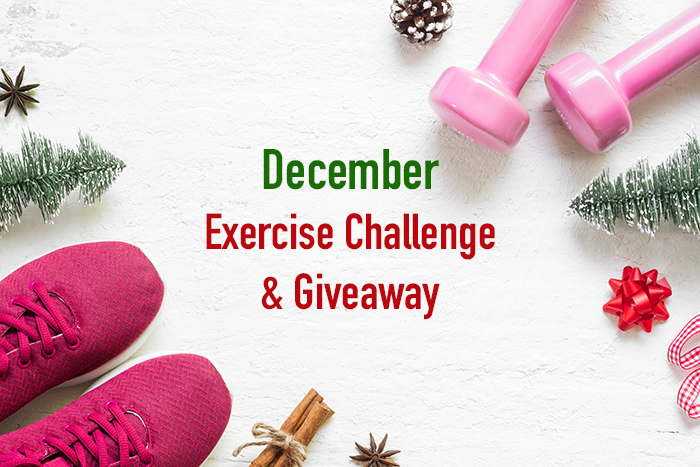 – The exercise challenge starts on December 1. The giveaway starts today! 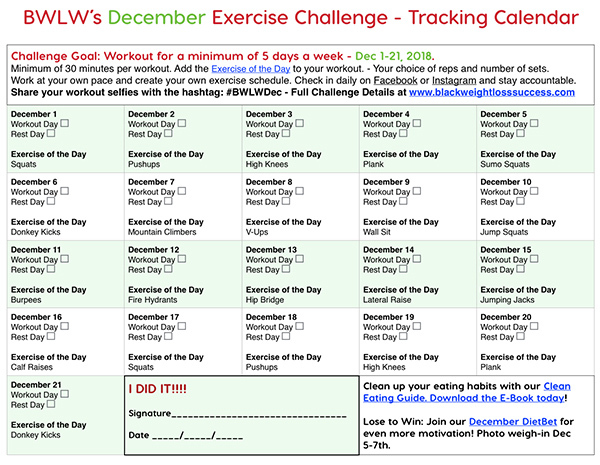 Exercise Challenge Goal: Workout for a minimum of 5 days a week – Dec 1-21, 2018. You’ll find this month’s daily tracking calendar below. Join our December Giveaway! We just want to share some love with the BWLW sisterhood this holdiay season. Three winners will be announced on December 22nd (by 5pm EST). One winner will receive a $50 Amazon Gift Card. One winner will receive a Fitbit Alta HR (Large band). One winner will receive a NutriBullet Pro 900 Watt Blender. We all get super busy during the holidays, and it can be challenging to stay committed to your workout routine. This challenge allows you to create an exercise schedule that works for you. Exercise for a minimum of 30 minutes per workout. Your choice of exercise. – Chose a workout routine that fits your current level of fitness, and work at your own pace. Stay hydrated: Drink at least 64 oz of water each day. (If you drink much more than that or have medical limitations (due to kidney issues or other ailments), do what works for you. Need help with your eating habits? Download our Clean Eating Guide. Tracking Calendar: Check off the box each day to record whether it’s a Workout day or a Rest Day. Each day that you workout, you’ll include the Exercise of the Day listed on the calendar as part of your regularly scheduled workout, or you’ll complete the daily task in addition to your workout. 1. Leave a comment below and tell us why you are joining our December challenge. 2. Check in Daily on Facebook or Instagram! 3. Share your Workout Selfies. Use the Challenge Hashtag #BWLWDec when you post workout selfies. BONUS Challenge: Lose to Win: Join our December DietBet for even more motivation! Photo weigh-in Dec 5-7th. Disclaimer: Before starting any exercise program, please consult with your doctor. We cannot be held responsible for any injuries resulting from attempting this exercise routine. If you have injuries that could be worsened, are pregnant, have knee issues, or are suffering neck and back pain, you should speak with a professional trainer about what workouts would be best for you. Do not attempt if you have current injuries, past surgeries or other physical issues/health issues that could be affected by exercise. Don’t forget to stretch before and after working out to avoid injuries. If you feel pain or severe discomfort, stop. That’s for sure. We can do this. Jesus said we can do all things Thursday Christ Jesus who strength is. I’m in! I don’t want to start 2019 in the hole! By that I mean, I don’t want 10 extra holiday pounds to have to work off on top my other health and fitness goals. I’m in! This is just what I need to get into my dress in February!! Yesss! I’m in. this is a very supportive group. I am ready for a change. Now it’s time to challenge myself. I’m in. Continuing on this weight loss journey!! I want to join this challenge to lose eight to wnlost in the US Navy and be around my daugther for a very long time. I am joining this challenge as a present to MYSELF for my birthday in December. I, too, have a December birthday. Your post might be just the encouragement I need to gift myself as well! Get my life in order! I’m in! I need to get my health in order and stop playing! Coming back from an injury and this will help with accountability. I am joining because I need something to motivate me to get me out of this stagnant place I am in. Also to be honest and transparent I want to win one of those great prizes, lol My blender just broke and I need a new one. . I am joining because I keep saying I need to workout and never do! What better time to get fit!! Same here. I’m looking for the positive accountability over shaming. I’ve decided to not wait until January to start making changes now. I am super excited to start this challenge..
I’m in. Lost my exercise edge lately and hope this will get me back on track! I need this challenge to keep me focused and on track during the holidays. Need some changes.This is a great start. Making myself accountable for my behavior. I would love to join this challenge as motivation and accountability. Plus I would love a new blender 😂. I’m in!!!! Very excited just what I need to start off. I want my energy back so I can enjoy my kids and finance more. I also want to do this for me. I’m excited to join because I want the stress relief that exercising provides, to improve My health and to shape up My body. This is just what I needed. I’m coming off a nutrition challenge, but the Thanksgiving holiday made me slack with my workouts for the last week or so. Now that I have my food in check, it’s time to get back to training. And this provides me with accountability since I have to check in each day. I’m in I usually start then start slacking in my exercise/nutrition journey. This will hold me accountable. I decided to join this challenge because I need to lose 5-10 pounds. I really want to lose weight. I been struggling with trying to lose weight for years. I am 33, and I am ready for a change. I believe this motivation will push me to do what I need to do..
I’m joining because I need the structure, motivation, and encouragement to get on a good workout routine and stick with it. I’m getting older and my health isn’t at its best. I gotta do this for me but mostly for my son and daughter who are 9 and 8. I’m in! It’s just the motivation needed to help me reach my goals! I’m here for it. I’m joining because I have been trying to loose weight for the past 4 years and the progress has been slow. I want to be healthier, look healthier and feel great. This will help me to get and stay on track and to finish the year out strong and on a good wellness note! I’m in need this as a form of motivation, to remind me that I dont have to wait till 2019 to start new. I’m in. Want to end the year strong! I definitely need this challenge right now especially after realizing a lot of my pants are fitting a little too tight. I’m all in on the December challenge!! I’m in because I want to get back to my old self, my comfort zone. Just recently had my 3rd child and just want my body back. Let’s get it!!! I need this in my life right now, joining! Hmmm…. I have to kick-start Myself to be happy with my weight, appearance and first & foremost, to get off the Blood Pressure meds. I want to look at myself and say “yes, I did it & am proud of Me” – as my size has blighted me for far too long. I want to be fit & healthy for the betterment of my Grandchildren and to enjoy my 2019 Holidays to Las Vegas and the Caribbean. I am joining because I am a young mother of two. I have diabetes and high blood pressure and it is beginning to take a toll on my body. I need to get it in motion. I want to become more fit. To get off my current medications. And to be honest look better in my clothing. I’m joining this will be a great jump start. I am In because I need motivation to stay consistent. I’m want to stay on track and not lose the fitness level I have achieved. Alright I’m in! Started a week ago on my exercise routine and this is a good support group to help me stay focused! I’m super excited to have joined this challenge…With some major life changes happening this year, I managed to gain 30 lbs of the 40 I had lost in the last 6 months. I’m ready to get back on track and take care of me. I feel so much better when I eat right and work out! I will be 54 on the 9th. I want yo loose about 20lbs and stay healthy. This will be exciting but challenging! Im in as i have joined several challenges and want to continue. Was laid off from my job so taking December for myself. Starting with working out 6 days a week. I’m no its 4 days in already but I’m in. Started today. I’m in. Already at 4 days of working out! I decided to enter the blog because I exercise, but I do not have a fitbit. I need one! Thanks for the opportunity. I enjoy joining a group focused on positive actions. I really want to start the new year off right so getting a little of a head start is even better.